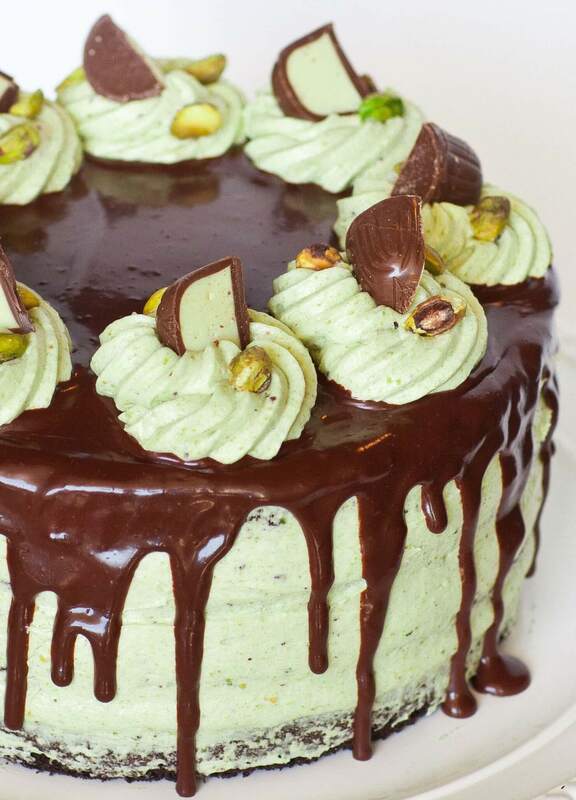 Isn’t this chocolate pistachio cake simply STUNNING?! I love everything about this gorgeous cake! It’s made with a heavenly combination of chocolate, pistachios and Irish cream! This unique and delicious chocolate cake was inspired by one of my favorite chocolate truffles. The rich pistachio buttercream is made with pistachio butter, Irish cream and cream cheese. It’s one of my all-time favorite frostings; I can eat it by the spoonful! Watch my video recipe for step-by-step instructions! Want new recipe updates? Subscribe to my YouTube channel to get a notification each time a new recipe goes live! The chocolate cake layers I use for this cake are moist and rich in flavor. I’ve used the same versatile recipe for many recipes. The chocolate cake layers are soaked with more Irish cream to give the cake even more flavor! And to make this cake even more special, I coated it with chocolate ganache and garnished it with my favorite pistachio truffles! 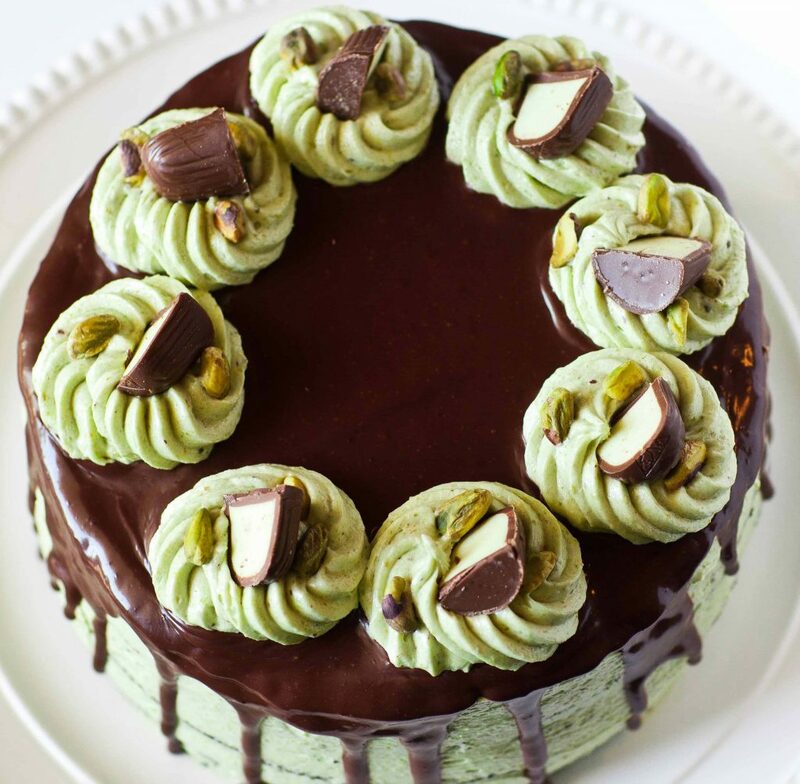 This unique pistachio cake recipe has been a huge hit on my blog and for good reason – it’s soo good! You’ll love every bite of this chocolate and nut cake. I purchase these pistachio truffles from a local Russian supermarket. I have yet to find them online anywhere, but I will add a link if they become available! Godiva also sells a similar truffle. Preheat oven to 350F. Line two, 8-inch cake pans with parchment paper and spray with non-stick spray; set aside. Place butter, eggs, vanilla, and sugar into a mixer bowl. Mix on high speed until smooth and uniform. In separate bowl, combine flour, baking powder, salt and cocoa powder. Use sifter or fine mesh strainer and sift in the flour mixture into the batter gradually, alternating with the milk; use spatula and mix by hand as to not over mix! Divide cake batter evenly between the two pans and bake in preheated oven until tops are completely set and toothpick inserted into the center comes out clean. Remove cakes from pans once baked and let cool completely on wire rack. Once cooled, slice layers in half, to have four layers total. Prepare the buttercream. Place pistachios into a food processor and pulse until nuts resemble fine crumbs. Add Irish cream and a few drops of green food coloring. Continue mixing in food processor for a few minutes until mixture resembles thick paste. Into a mixer bowl, add the butter and cream cheese. Mix until well-combined and fluffy. Add the prepared pistachio cream; gradually add the powdered sugar. Add less or more to your liking; more for a thicker buttercream. Reserve about 1 1/2 cups of buttercream in a pastry bag tipped with a star tip. To assemble the cake: lightly drizzle each layer with Irish cream and fill generously with buttercream. Frost the outside and smooth out top and sides. Place cake into the refrigerator and let it set for about 20 minutes. Meanwhile, prepare the chocolate ganache. Whisk together 3/4 cup chocolate chips with hot heavy cream until smooth. Pour into a ziplock bag and let the ganache stand for about 5 minutes to allow the air bubbles to dissipate. Pour ganache over the top of the cake and use spatula to smooth out the top. Let the chocolate ganache set in the refrigerator, then garnish top with reserved buttercream. Can top cake with whole pistachios and chopped chocolate truffles. Let cake stand in refrigerator for a few hours to set. Remove about 30 minutes before serving; perfect with coffee and tea. Absolutely wonderful recipe. I have made this in cupcake size and also a whole 8″ cake. I love the rich chocolate cake that is not weighted down by too much butter, so nice, moist after a good drizzle (I drizzled A LOT, hehehehe) of Irish cream. And the pistachio cream is so good! I did make some alterations to the sugar content though, hubs is diabetic and the rest are quite health conscious. also reduced butter amount for the cream. still turned out awesome! Oh, and they taste better after a day or 2, when all that Irish cream has worked through and permeated cake . I decorated with strawberries cuz I can’t find them pistachio pralines here. I wish I could post my pics here! Thanks so much for this recipe Tatyana! Hi! 🙂 I use American standard measuring cups for all my recipes. To convert the amount, you will have to search Google for each ingredient, for example. 1 cup flour to grams. Thank you very much! I will be sure to cook your recipes! Made this tonight for my family Christmas party. Followed the recipe exactly how it is here but I didn’t like it. Maybe I don’t have a pallet for Irish Cream. It was just not good. Looks pretty though. Can’t wait to try this! There is a bakery called Andre’s that makes something that looks similar and it was my mom’s favorite. Sadly, they closed the one in Houston and I have been searching for a recipe for years.